A smooth metallic border runs around the smartphone, holding the glass panels together. And on the right hand side you’ll find the power button and volume rocker, set out as three, aesthetically pleasing, equally spaced buttons. The rear camera is the headline of the X4. The dual lens setup protrudes slightly from the back of the phone, with a clock-like circular bevel, providing a really premium look and feel. There’s also a dual LED flash on board to light up those darker shots. 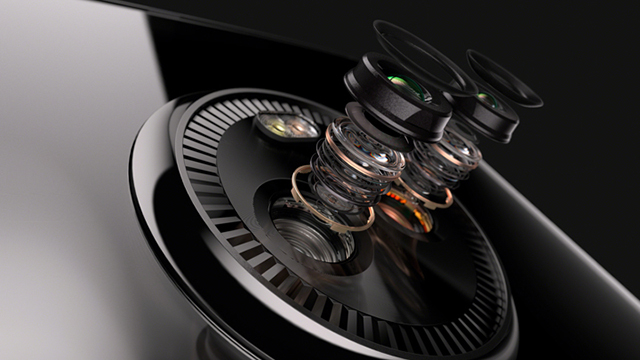 At 12MP and 8MP, you can expect an impressive level of photography, and the latter lens comes with a 120-degree wide-angle field of view, purposely designed so you can get more in the frame. The camera is no one-trick pony, however, with a host of other abilities to take your photography game up a level. Autofocus, selective focus, spot colour, and slow-mo effects are just a few of the features that really put this camera on the map. And if that’s not enough you can also record 4K video at 30 frames per second. Around the front there’s a third lens at 16MP, accompanied by its own flash. It’ll be big news for selfie fans, featuring a live beautification mode, which will airbrush out any imperfections so you always look your best. Under the hood there’s a lot going on too. On the power front you’ll be kept moving with a 2.2GHz octa-core processor and 3GB RAM. While a generous 3,000mAh battery cell is on board to take you all the way through the day. The Moto X4 is charged up using USB Type-C – the latest in USB technology. It’s able to provide 6 hours of power from just 15 minutes plugged into the wall when using Motorola’s 15W TurboCharger. And finally, the smartphone is protected against water and dust, certified as IP68.